Many people want to understand what revolutions are and – especially – how they come about, from the academics who study them to the states that wish to prevent (or, in some cases, provoke) them. 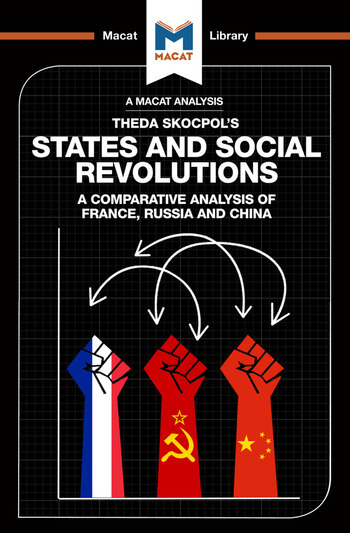 But it is arguably the US scholar Theda Skocpol who has done most to create a viable model of revolution, and States and Social Revolutions is the work in which she sets out her intellectual stall. Skocpol's magnum opus can be considered a classic product of the critical thinking skill of problem-solving. She assesses several different revolutions – those of France, Russia and China – and asks new, productive questions about their causes and outcomes. The answers, collectively, allow her to move beyond existing theories such as the ‘voluntarist’ school (which suggests that revolutionaries have agency) and the Marxist school (which sees state institutions as nothing more than a front for class interests). Skocpol's model assumes that states are autonomous bureaucratic institutions, which act in their own interests – a fundamental re-imagining based on fresh interpretations of the evidence. Her analysis extends beyond the causes of revolution to their consequences, and her argument that the revolutionary state that survives is the one that successfully implements a far-reaching program of reform helps to explain not only why the three revolutions she studied have proved enduringly influential, but also why hundreds of others, less successful, are barely remembered today.